Two track defects identified overnight Saturday caused Orange, Silver, and Blue line trains to experience up to around 15 minutes of delay Monday morning as they traversed eastbound through the rail system into DC. The delays were caused by a 15mph speed restriction departing Rosslyn towards Foggy Bottom, which caused congestion and forced trains to hold at various stations. A MetroAlert was issued at 8:57 am the morning of the 23rd notifying riders to expect delays due to a “track condition” affecting 1900 feet of track. WMATA later created a service alert page to keep passengers updated, and used this link in responses to questions tweeted at their service accounts. The Rail Operations Control Center (ROCC) first began notifying operators of the speed restriction at 4:58 am Monday morning after an operator reported that she had low (15mph) speed readouts upon departing Rosslyn. Upon discovering the defects, WMATA track crews requested to bring in a Prime Mover to the area in order to address the restriction. Within around 15 minutes of the ‘major track defect’ having been identified, ROCC began clearing a route for the closest-available Prime Mover, located near Stadium-Armory, to be able to travel down to Rosslyn to begin fixing the issue. The work where the Prime Mover was located was then canceled, as the unit was required to complete the work. The slow speed restriction remained in place when the system opened at 7 am on Saturday and continued to be in effect through Monday. After issuing the restriction Saturday morning, Automatic Train Control (ATC) personnel implemented “slow speed couplers,” which can automatically force trains to slow to 15mph in the affected area. This automatic speed reduction procedure increased the length of the slow speed restriction from 1900 feet to just over 3,325 feet. The implementation of the restriction effectively doubled the time it took trains to transit from Rosslyn to Foggy Bottom from around 2 minutes 3.5-4 minutes, according to speed data provided by MetroHero. Delays caused by this restriction were not noticed on Saturday or Sunday due to relatively-low level of train traffic, compared to a weekday rush hour period. Trains were slowed in the defect area, but were able to speed back up and remain on schedule by the time they reached Foggy Bottom. 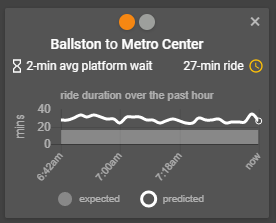 A screenshot of a MetroHero graphic showing trip times for Orange/Silver line trains from Ballston to Metro Center in the 7 am hour show trip travel times constantly exceeded the expected trip time. This “squiggly chart” shows Silver Line trays in silver leaving Wiehle following their set schedule (the black slanted lines) as they travel towards McLean in the direction of Largo in the 8 am hour. The further the silver line deviates from the black line, the more off-schedule the train is. WMATA track personnel performed an inspection of the defect area during the mid-day period on Monday, October 23rd, but released no further information about what was found or further plan of action. Overnight trackwork Monday evening appears to have fixed the fastener issue outside Rosslyn, and removed the restriction. Trains were moving normally Tuesday morning as rush hour progressed. Screenshot of MetroHero raw travel data for trains from Rosslyn to Foggy Bottom (track C1 only) on October 20th. The average trip time is just under 2 minutes. Screenshot of MetroHero raw travel data for trains from Rossyn to Foggy Bottom on Sunday October 21st. The average trip time has jumped to over 3 minutes after implementation of the slow speed restriction departing Rosslyn. Train 611: Oh, we going to have fun today. That’s like half the distance in between Rosslyn and Foggy! ROCC: Attention all operators, we have couplers turned track 1 between Foggy Bottom and Rosslyn. If you’re holding for any reason in that area, make the appropriate announcement to your customers. Track 1 between Foggy Bottom and Rosslyn, couplers are turned. Special thanks to Luke B. and those that reported slow speeds between Rosslyn & Foggy Bottom for their contributions to this report.